Jatiluwih Rice Terraces Bali is one of the most famous rice fields in Bali island in addition to Tegalalang rice terraces in Ubud, Munduk rice terrace in north Bali, and other best rice paddy fields in Bali, Indonesia. Jatiluwih is a village that has vast rice paddies with beautiful views of terraced paddy fields landscape located in the Sub-District of Penebel, Tabanan Regency, Bali. If you are looking for the best place to see rice fields in Bali, then the Jatiluwih rice terraces could be on your list. 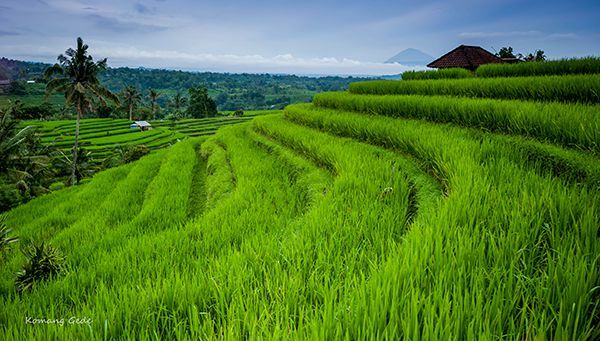 The Jatiluwih rice terrace is the most beautiful rice fields in Bali that we know so far. Jatiluwih village is famous as a tourist spot of terrace farming which is still using Balinese traditional irrigation system, Its location is close to The Mountain Batukaru with air condition fairly cool. To visit Jatiluwih rice terraces can be reached by a distance of approximately 50 KM or approximately ± 1 hour 30 minutes from the city of Denpasar. For those of you who are on holiday on the island of Bali, the tourist attraction Jatiluwih rice terrace could be an option for a vacation to enjoy the beautiful panorama of terraced rice fields that captivate. To know the history of Jatiluwih wholly based on the stories of parents who are residents of the village of Jatiluwih. Said that the story of the name Jatiluwih is derived from JATON and LUWIH. "Jaton" means amulet, while "Luwih" means good, From the meaning of that words it can be concluded that the Jatiluwih has a meaning is a village that has amulets were really good/powerful or intestate. From other sources told that it is said in the middle of the village there is a graveyard of ancient animals of bird JATAYU. From this Jatayu word gradually changed the pronunciation became JATON AYU meaning Luwih or Good. So JATON AYU equal to JATILUWIH. This is how the word Jatiluwih since the first set to be the name of the village and to this day has never changed. From the meaning of Jatiluwih, until now can be evidenced by the results of the farming and gardening are sufficient to meet the necessities of life and prosperity for all its people and ensuring safety for the population during the run to farm life. So at the time past many are coming into Jatiluwih of the Brahmins, Kshatriyas, Sudras, and Wesia with expectations for the safety and prosperity of each of their group. Finally, they set up temples which are now located in the region of the village of Jatiluwih like Pura Luhur Petali temple, Pura Luhur Bhujangga Waishnawa temple, Pura Rshi temple, Pura Taksu temple and other shrines around the region. In terms of geography, Jatiluwih has an area of ​approximately 33.22 km2, with a height of approximately 1,059 meters or 3.476 feet above sea level. Jatiluwih has a tropical climate at almost throughout most months of the year, there was significant rainfall in this area, the annual temperature is an average of 19.0° C.
Jatiluwih is an agricultural area with rice farmers as the majority of the population. Aside from being a producer of rice and red rice from broad and large paddy field terraces, this region also produces other crops such as vegetables, coconut, coffee, bananas, etc. Other than that, at this point in the community of Jatiluwih also have formed groups of farmers who will then be able to increase the income of the community as a fish farmer groups, livestock groups, etc. 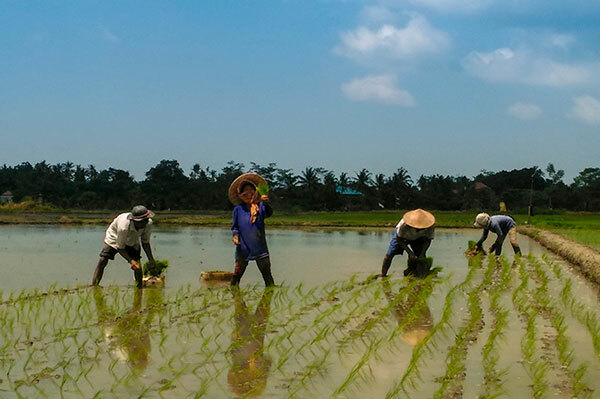 A Community organization that specifically regulate irrigation systems which are used in rice farming in Jatiluwih and in all around Bali island is referred to as Subak. Jatiluwih village has been defined by UNESCO as a world cultural heritage site since June 29, 2012 because it has a unique farm with traditional irrigation system which is using the concept of Tri Hita Karana philosophy (the philosophy of harmony between man and his neighbor, man and nature, as well as human and The Creator). Jatiluwih rice terrace is part in the area of ​​Subak Landscape of Catur Angga Batukaru which is one of five regions in Bali designated by UNESCO as cultural landscape. Organization management of Subak of Jatiluwih is based on the principle of the philosophy of Tri Hita Karana which aims to achieve and to implement the harmony among the members of Subak, between members of Subak with environment/nature, and with The Creator/God. Jatiluwih is very famous for its rice terraces and its irrigation system which is run by Subak members, despite the philosophy of Tri Hita Karana which is the base philosophy of farmers in Jatiluwih, then in terms of the processing of rice fields is also based on it, in this case is the connection to The God as The Creator to perform some ceremonies that are part of the activities of farmers like; cultivate paddy, rice planting, harvesting, and so on. Mapag Toya, is the ceremony to take/fetch water to the fountain. The ceremony is attended by all members of Subak and performed at the Sasih Ketiga or in around the month of September. This activity is called Kempelan, the activities to open water channel to a source of water flow in the upstream water control system, then the water will flow through the rice fields. Ngendag Tanah Carik, is a ceremony to God for safety when plowing the rice fields, it is done by each member of subak. This procession is still on Sasih Ketiga (in September). Ngurit, is a nursery ceremony performed by all members of Subak on each cultivated fields. Ngurit held on Sasih kelima (around November). Ngerasakin, is a ceremony to clean the impurity (leteh) which is left behind when plowing the rice fields, the ceremony is performed after the plowing activities are completed in each of arable land in the early Sasih Kepitu (early January). Pangawiwit (Nuwasen), is the ceremony to find a good day to start planting rice, it's carried on Sasih Kepitu (in January). Ngekambuhin, is a ceremony to ask for salvation to God of the new rice growing, it is done when the paddy is at 42 days old, in around Sasih Kewulu (February). Pamungkah, is a ritual to invoke the safety so that rice plants can grow well. The ceremony is conducted in Sasih Kawulu (February). Penyepian, is the ceremony for safety in order to prevent rice plants from pests/diseases and it is performed on Sasih Kesanga (around March). Pengerestitian Nyegara Gunung, is the ceremony conducted in Pura Luhur Petali Temple and Pura Luhur Pekendungan Temple (March/April). Mesaba, is a ceremony before the harvest that is done on Sasih kedasa (in April) by members of Subak in their paddy fields respectively. Ngadegang Bhatari Sri (Bhatara Nini), is a symbolic ceremony to visualize The God as Lingga-Yoni (Shiva Lingam). Nganyarin, is a ritual to start the harvest carried out in Sasih Sada (June) by Subak members on each of the fields. Manyi, is rice harvest activities (in July). Mantenin, is a ceremony to raise and store the rice in the barn which is held on Sasih Karo (August). Jatiluwih is very famous for its natural beauty with terraced rice fields and becomes one of the best tourist destinations in Tabanan, the activities of farmers in Jatiluwih is one of the separate attraction for tourist. In general, the activities of farmers in the rice fields are still using methods and traditional tools to work, like Hoeing, Nampadin (cleaning the rice field), Ngelampit (plowing fields), Melasah (paddy land leveling), Nandur (growing rice), etc. The farmer activities in the Jatiluwih paddy fields is often used as an object for photography. In the region, there are also tourism activities such as hiking and cycling and to support the tourism facilities there are also available some inns/cottages, shops, cafe/restaurant that serves typical foods with special red rice of agricultural products in Jatiluwih. To visit Jatiluwih rice terraces is recommended between the hours of 8:00 am till the afternoon at about 5:00 pm, because in between these hours the activities of farmers will be encountered. Due to heavy rainfall in the region of Jatiluwih, it is advisable to always carry an umbrella or a raincoat, or monitor the weather the day before to find a good and sunny day in Jatiluwih. To be able to enjoy the natural scenery with green land terraced rice fields in Jatiluwih, then the best time to visit Jatiluwih is between February to April, as this month rice crop will grow tall with green or yellow colors. At around the month of June - July (sasih Sada), the rice crop will be ready to harvest and harvest activities by farmers will be encountered.